Get the X component of the state. Get the Y component of the state. Get the yaw component of the state. This is the rotation in plane, with respect to the Z axis. 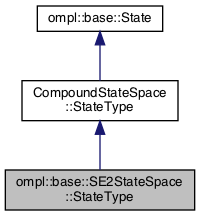 Set the X component of the state. Set the Y component of the state. Set the X and Y components of the state. Set the yaw component of the state. This is the rotation in plane, with respect to the Z axis. Access const element ith component. This does not check whether the index is within bounds. Access element ith component. This does not check whether the index is within bounds. The components that make up a compound state. Definition at line 53 of file SE2StateSpace.h.